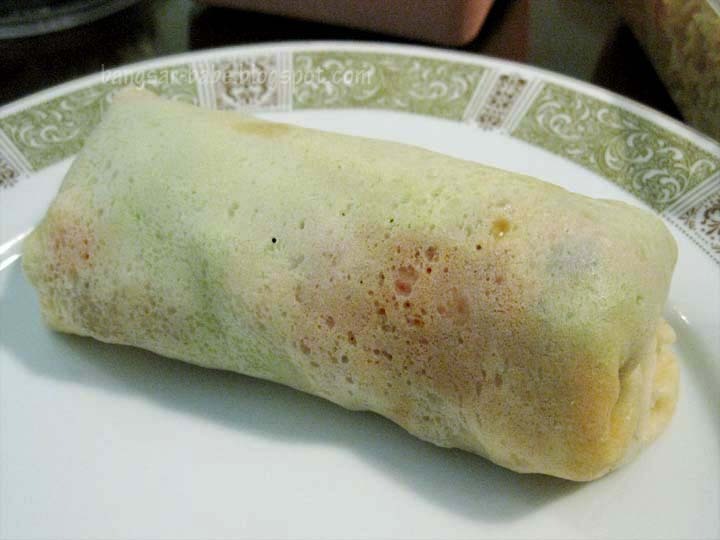 I’ve never been to a popiah party and the popiahs I’ve eaten are either made by my mum or the pasar malam variety. No offence to my mum, but her popiah is rather bland (popiah, sengkuang filling and kampung koh chilli sauce only); unless they are fried. 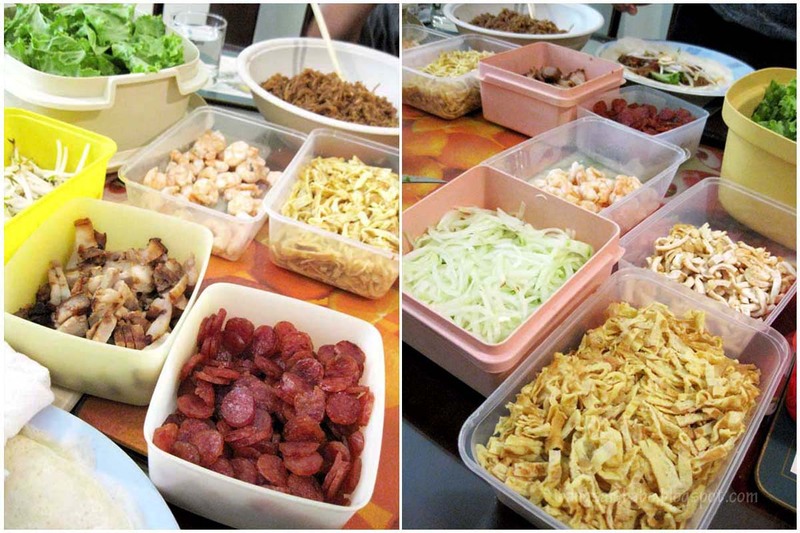 Last weekend, rif’s mum invited me over for a popiah party. I didn’t want to go because I assumed it would be like my mum’s popiah. 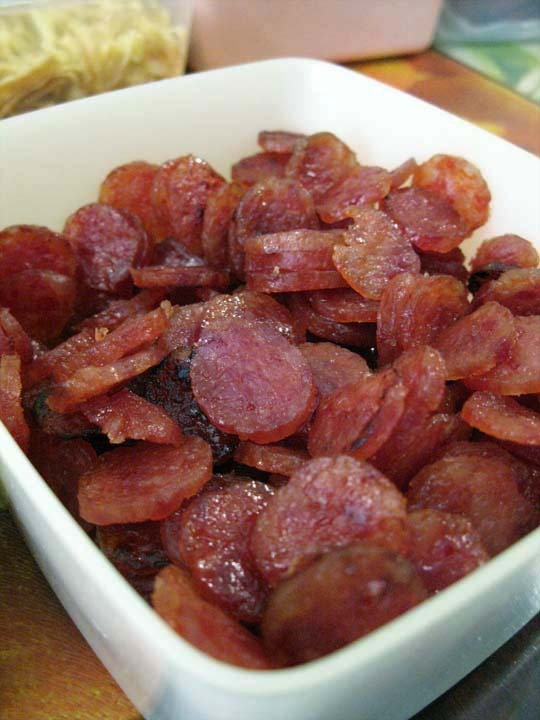 But rif tells me his mum’s popiah is pretty good, and that people love her popiah parties. While I wasn’t entirely sold, I went because it would be rude not to. When I got to his place, I couldn’t believe the huge spread on the table. There was lap cheong (Chinese sausage), char siew, shredded omelette, prawns, pork lard, beansprouts, julienned cucumbers, coriander leaves, lettuce leaves and the main ingredient, sengkuang filling. His mum made almost everything, including the sauces. 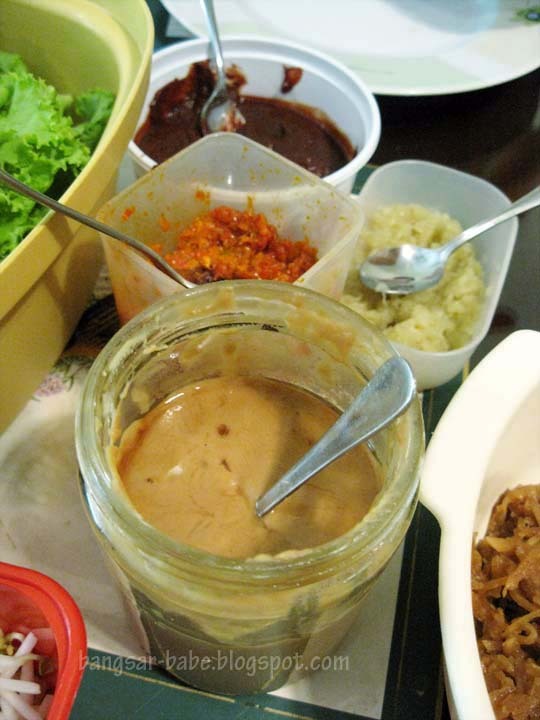 The lighter brown sauce is a Malacca Nyonya sauce made with gula melaka, flour and some salt. I loved it. Her chilli sauce was packed a good kick — spicy, tangy and fragrant. 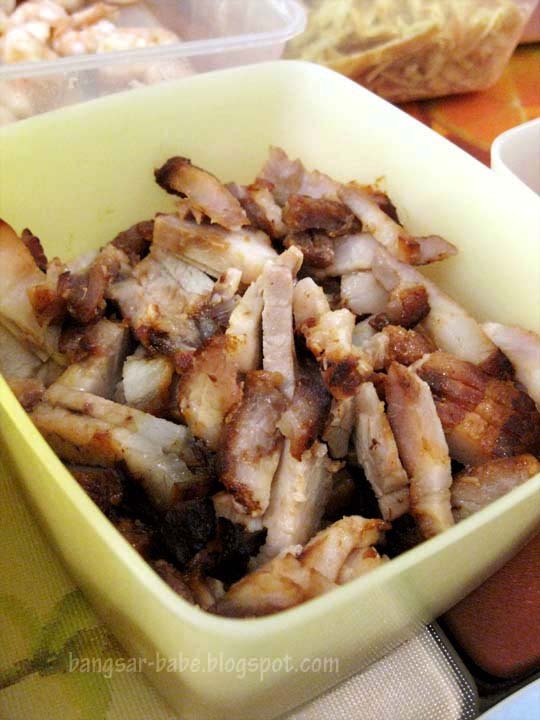 She prepared the char siew the night before and made the popiah skin in the morning. I shudder to think how long she spent making the sengkuang filling, omelette strips, sauces (chilli sauce, garlic paste and Nyonya sauce), peeling the prawns, marinating and grilling the char siew and making the popiah skin. The popiah skin has to be kept moist and warm, hence a damp tea towel was placed on top of the stack. 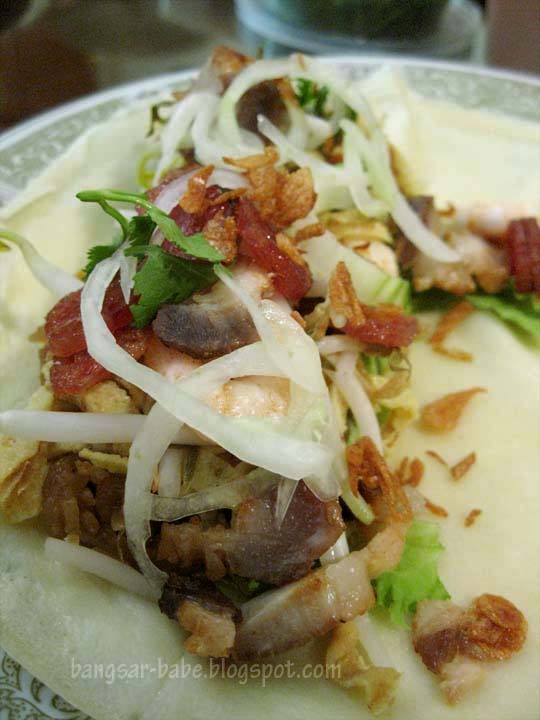 To wrap a popiah, you take a piece of skin, layer on a lettuce leaf, spread your choice of sauce onto the leaf and then pile on the sengkuang filling. On top of the filling, layer your toppings of shredded omelette, cucumber, whole prawns, slices of lap cheong, beansprouts and fatty char siew. Then you add the garnishing – ground garlic, sweet chilli sauce, fried crispy Chinese shallots and coriander leaves. The best thing about making your own popiah is you get to choose the ingredients, and omit what you don’t like. After you’ve assembled the ingredients for your popiah, roll it up by folding in the edges and rolling the skin into a spring-roll shape. You can either put the filling in the middle or the side. I like the putting it at the side, while rif likes putting it at the centre. I rolled three enormous popiahs that were too ugly to photograph, and rif thought it was the ugliest looking popiah he has ever seen. I stuffed my popiah to bursting point and it was really hard to roll. The skin broke. 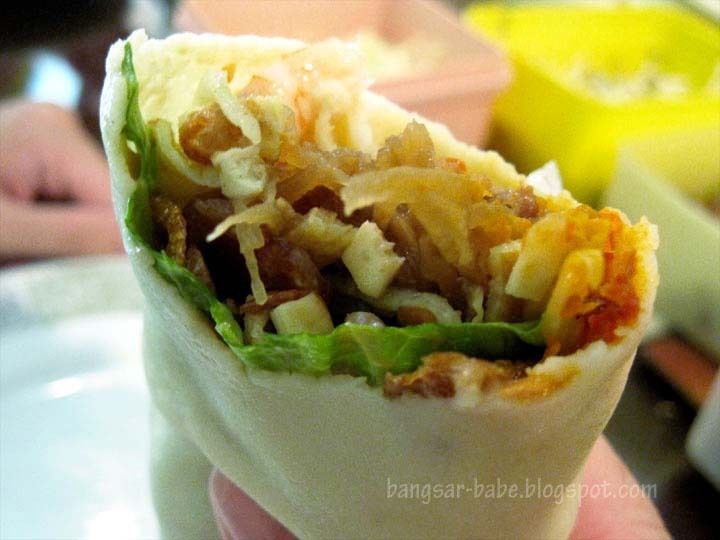 No crispy pork lark like the famous malacca popiah? 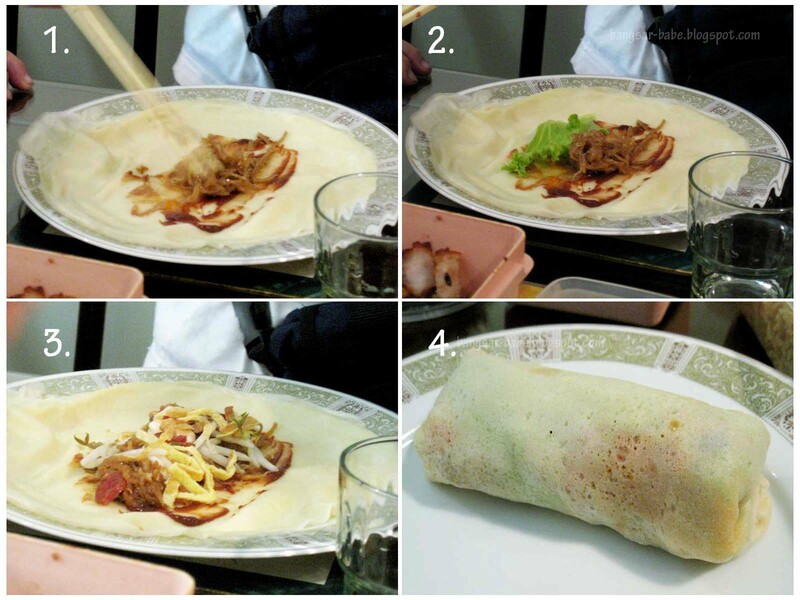 Since the original post, did you learn the skills to prepare homemade popiah? LOL…you are so lucky to have a MIL who is a good cook. If you don’t mind me saying this,I would like to make you aware that yesterday,I could not load your website. It kept asking me to download a file(apk file) to open your page. After download it still would not open. Were you aware of this? Thought I would mention it. This is the best Nyonya Popiah Money Can’t Buy popiah I ever taste! Thx for the great popiah today.